The Hendley Building is the oldest remaining commercial building in Galveston. Constructed in 1860, the Greek Revival-style building is actually four, attached brick buildings located in the Strand National Historic Landmark District. 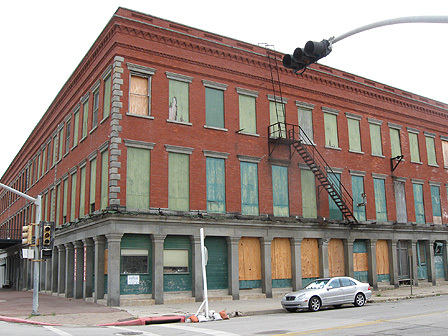 The building was constructed to serve as offices for brothers William and Joseph Hendley, cotton and commission merchants. The building served as a Confederate watch tower during the Civil War. The first floor of the building was last used by a produce distributor in 2000 and subsequently, has been vacant. The Galveston Historical Foundation hired an engineering firm to provide a structural assessment of the building and it was estimated that $170,000 was needed to stabilize the building and to prevent further water infiltration. UPDATE: The Hendley Building has been stabilized and four new retail sites have been open on the first floor in 2015.